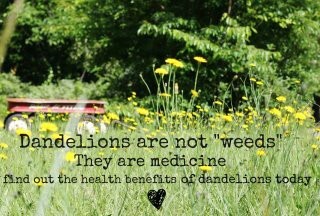 KISST Organics Health & Wellness Blog - Dandelions Are Not Weeds! 2 ) Detoxification of vital organs : Because of the diuretic abilities of dandelion root, it is beneficial for flushing out the Liver, Kidneys and Gallbladder. İt works great to purify the blood and cleanse the system. This also makes it a good herb for Fighting İnfections. 3 ) Dandelion tea actively ameliorates disease—it is a potent disease-fighter—and helps the body heal, helps Boost İmmunity and Heart Disease, and age-related Memory Loss. 4 ) Treating Anemia : Because of the high content of iron in dandelion root, it is beneficial for building red blood cells in the body to treat anemia. 5 ) Treating Diabetes : Dandelion root has been shown to lower blood sugar levels in patients. In Europe, it's used to treat Type-1 and Type-2 diabetes. 6 ) Digestive System : Dandelion root, when made into a tea, is beneficial for relieving constipation, flatulence and fullness. 7 ) Treating High Blood Pressure : Dandelion root is a natural Diuretic. When combined with its high potassium content, it is an effective treatment to lower blood pressure. 8 ) Dandelion tea helps reduce High Cholesterol. 9 ) High Nutritional Value : Dandelion root contains vitamins A, B-complex, C and D as well as the minerals İron, Zinc and Potassium. This combination of vitamins and minerals also makes dandelion root a High Antioxidant Food. 10 ) Mood Enhancer : Due to the high amount of vitamin B-complex, dandelion root can help to stabilize mood and Treat Depression. 12 ) Dandelion root is also used to treat skin disorders such as Acne, Eczema and Psoriasis. 13 ) Laxative : Dandelion root is also a mild laxative and is used to help with regularity. 14 ) Dandelion tea helps with weight control—especially with Weight Loss. 15 ) Dandelion regulates the liver improving the function which can help improve thyroid function. There are very few side effects linked to using dandelion root. On occasion, allergic reactions to the herb have been reported. People taking prescription lithium, a diuretic, medication to lower blood pressure or medication to lower blood sugar should not take dandelion root. Women who are pregnant or breastfeeding should consult their doctor before taking this herb. The greens and the roots can be boiled or steeped to make a tea. They can also be tossed in with salad greens. Dandelion is an aquired taste. They are bitter but worth every bite! Use the greens when making an omlet or a stir fry as well. The flower or the greens can be used in wine making. The flower can also be tossed in a salad or eaten plain if you are not feeling well.